I don’t think you can say you have visited Hong Kong if you have not gone to Victoria Peak. I went on my first trip to Hong Kong about 10 years ago, and since I enjoyed it so much I wanted to take my friend, Courtney, there on this trip. There are lots of outstanding attractions in Hong Kong. 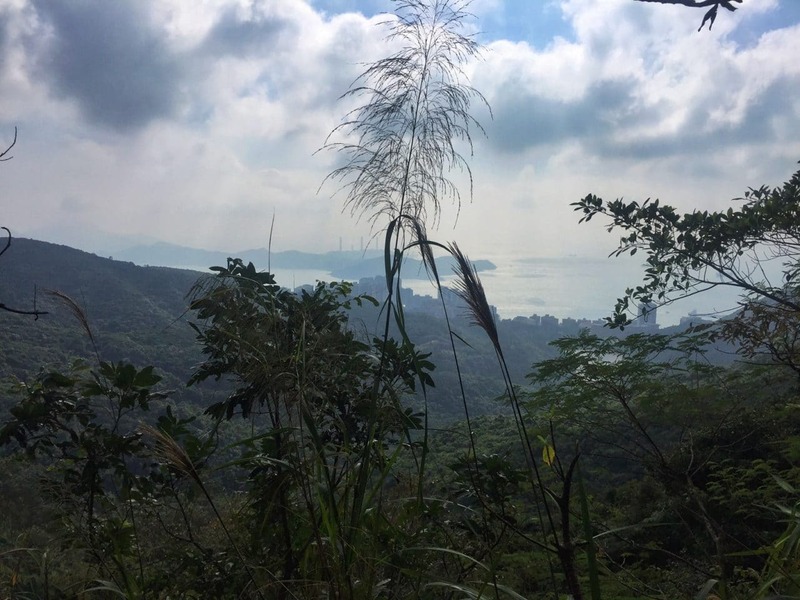 Why is Victoria Peak such a special place? Not only is there the iconic tram but you will also find some of the best views in Hong Kong. To help you plan your visit to Victoria Peak, I wanted to share information on how to get to Victoria Peak and the things to do once you get there. I love the mix of nature and the city skyline. Victoria Peak stands at 1811 feet above sea level making it the tallest mountain on Hong Kong Island. The Peak Tram has been taking people to the top for over 120 years! In the mid 18th century, Victoria Peak was an exclusive area where many of the upper class lived. It was not easy to get to those residences though. Then in 1873, a hotel opened and in order to increase business a better form of transportation to the top was needed. In 1888, the Victoria Peak Tram began service as the first cable funicular in Asia. The buildings peek out between the trees. 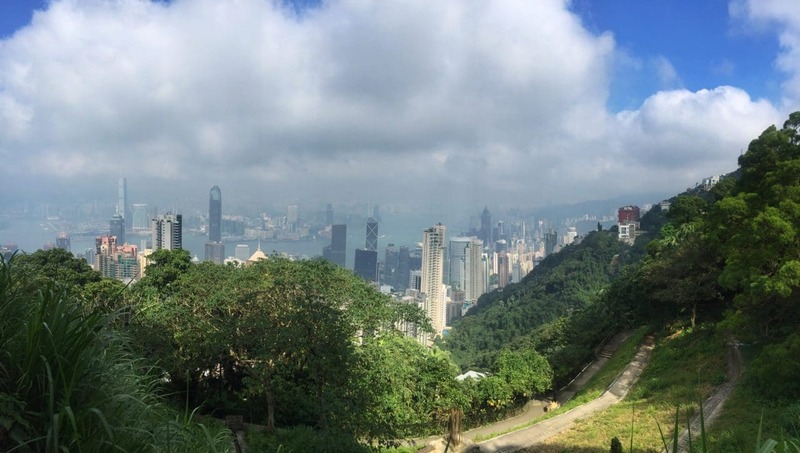 There are a few options for how to get to the top of Victoria Peak. The most popular (and iconic) option is to take the Peak Tram to the top. The Victoria Peak Tram is easy to get to using the Hong Kong transport. You can walk from the MTR Central Station J2 exit. The tram runs every few minutes from 7 am to midnight but there is often a line because it doesn’t hold very many people at one time. Now, there are several other options you can choose for getting to Victoria Peak. 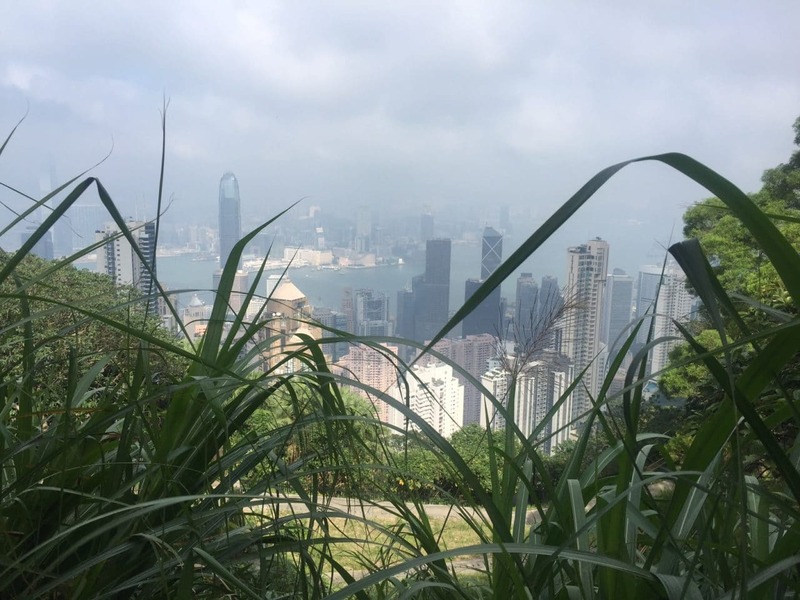 If you have time and energy, why not walk up Victoria Peak? 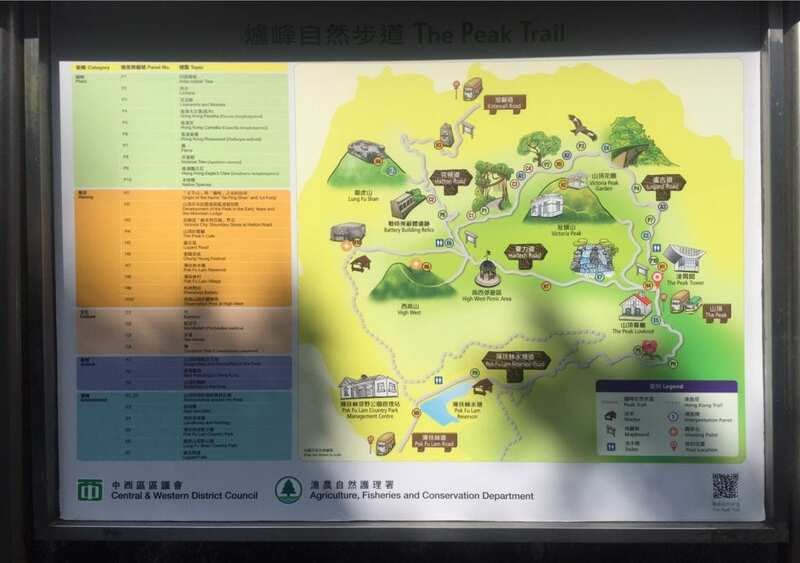 There are actually three different Victoria Peak hiking trails that you can choose from: The Morning Trail, The Old Peak Road Trail, and the Green Trail. I am going to try to hike up to the Peak on my next trip. There are also roads that go to Victoria Peak, so you can take a taxi or a bus. If you decide to take the bus, board the Peak Tram shuttle bus No. 15C at the Central Bus Terminus, close to Star Ferry Pier 8. You can enjoy some nice views as the Victoria Peak bus takes you all the way to the top. The bus to Victoria Peak costs 4.20 HKD per person from Central. A taxi will cost you around 50 HKD. They sell tickets for the tram where you board both at the bottom and top of Victoria Peak. Round trip tickets cost 45 HKD and one way cost 32 HKD for each adult. They also have ticket packages which include other features like the Sky Terrace 428 and Madame Tussaud’s. Victoria Peak is also included as part of the Hong Kong Pass and on some tours. We wanted to take the tram up, but when we got to the tram station at 1 pm on a Sunday, the line was an hour and a half long. With our tight timeline, we couldn’t afford to wait, so we decided to take a taxi to Victoria Peak. We would see if the line was any better on the way down. Lucky for us, it was, but I am not sure this is always the case. If you are tight on time and have your heart set on riding the tram both directions, you need a fast track ticket. You can purchase a Victoria Peak tour like this one that allows you to skip the line for the Peak Tram. For those that plan on doing more sightseeing while in Hong Kong, the best option may be to buy the Hong Kong Pass which lets you skip the queue for the Peak Tram and visit 13 other top attractions. Some places you forget you are in the middle of Hong Kong. When you purchase the Hong Kong Pass, you get skip-the-line access to the Peak Tram plus free admission to 13 other attractions in Hong Kong and Macau. You can find more details about the Hong Kong Pass here. In addition round-trip tickets on the Peak Tram, you also get free entry to the Peak Sky Terrace, Hong Kong’s highest observation platform and entrance to the Peak Tram Historical Gallery that has over 200 artifacts. To redeem your Peak Tram Sky Pass you just need to show your Hong Kong Pass at the Big Bus Tours Ticketing Counter located at Peak Tram Lower Station to collect your ticket before boarding the Peak Tramway. Another great view from the top of Victoria Peak. Since we didn’t have time to wait in the long line for the Peak Tram, we decided we would splurge and take a taxi. And conveniently, right by the line for the tram tickets, there was a taxi waiting. Unfortunately, that driver wanted 200 HKD to take us up. I refused to be ripped off so told him we would use the meter. He would not agree to use the meter, saying he was too busy. I was disgusted and he was obviously not busy! I hope no one falls for that scam artist. Then we walked around the corner to a taxi stand and after a few minutes were able to flag one down. We got in and I told him to take us to the Peak. Courtney pulled out her phone to follow along on Google Maps to make sure we were going the right direction. We had a momentary panic attack when it looked like we might not be going the right way. Courtney was worried I should have specified Victoria Peak. What if there were other peaks and maybe he was taking us to the wrong one. I told her if that happens we will just get out, grab another taxi and ask to go to Victoria’s Peak. Well, luckily the driver knew what we meant and he dropped us off in a parking garage. After paying the taxi driver 52 HKD, we entered the mall and came out the other side and there we were on top of Victoria Peak! Hong Kong is full of restaurant options and Victoria Peak is no exception. 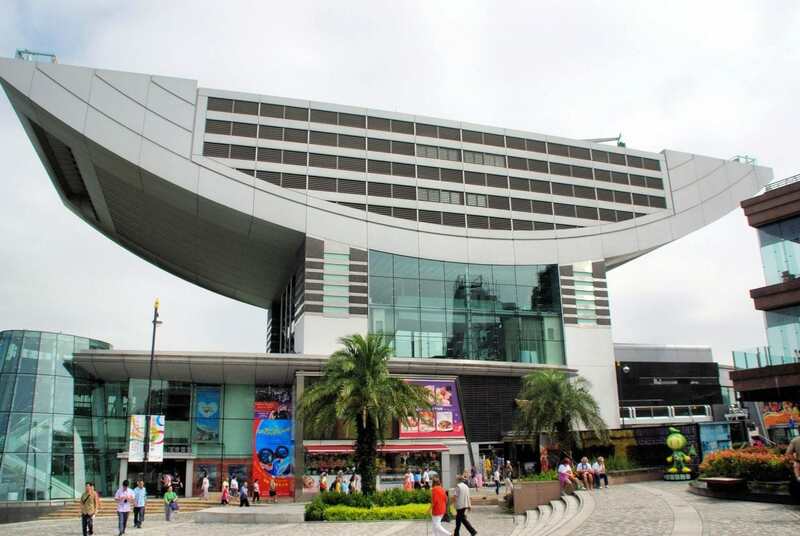 There are a range of options inside the mall on top of the Peak, all with about average reviews. If you are looking for some cheap eats, there is Burger King, Pacific Coffee, and Starbucks. Try Hong Kong Day if you are looking for a typical Hong Kong Cafe. There is also a Bubba Gump restaurant (same as the old in Times Square in New York) with a nice view. The most upscale option is the restaurant called The Peak Lookout. It has been open for over 50 years, although the owners have changed. Peak Tower has several dining options inside. If the weather is nice, it may be better to picnic outside. If you walk a bit from the tram station, I am sure you can find a spot with a view. Map of the paths around the top of Victoria Peak. 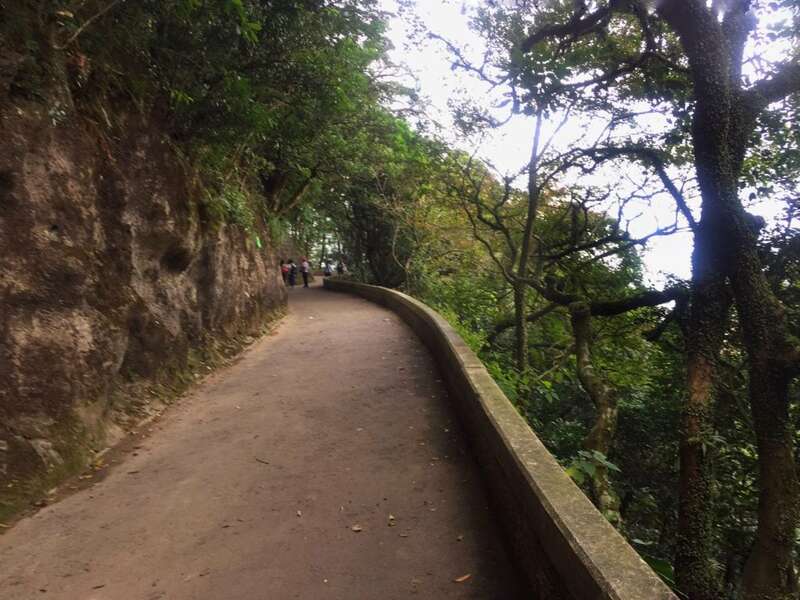 There is a whole network of paths to explore on Victoria’s Peak. If you go to the right (facing the shopping center) it is a short walk to some of the best views of the skyline. Of course, this section does get crowded but if you walk a little further you should be able to find a good spot for photos. If you walk a little farther you forget you are in a big city, there is just so much green. And if you walk to the left from the shopping center you will even see a waterfall. I wish I would have had more time to explore the trails up there more. If you prefer you can also go to Terrace 428 where you can check out the view from the top of the shopping center. You can buy a package tram ticket that includes it or pay 48 HKD if you buy a ticket separately. We decided to skip. I am not sure if the view from the Victoria Peak tower is much better from what you get on the path? Plus, we were tight on time. If you have more flexibility with your schedule, I would definitely recommend spending more time on the Peak or checking out some of the other Instagram friendly spots in Hong Kong. They did such a nice job with the paths on Victoria Peak. 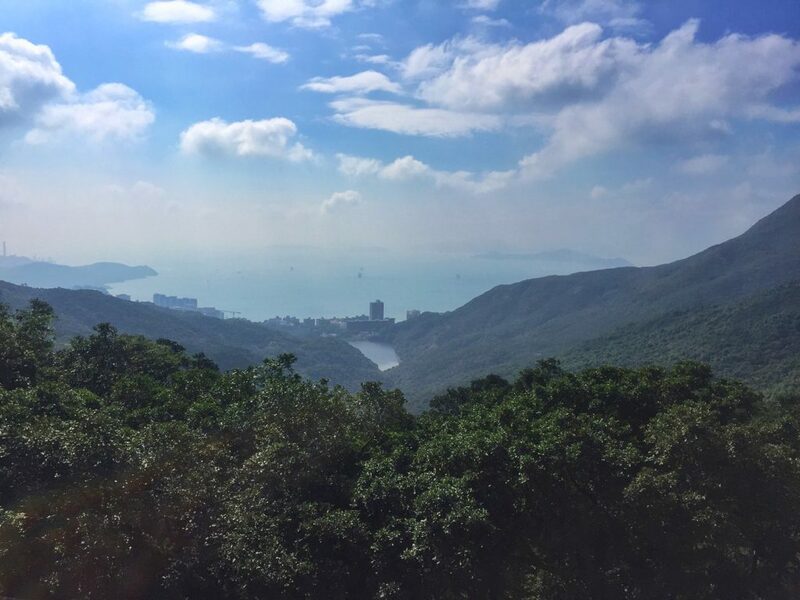 After we explored the Victoria Peak hiking trails a bit, it was time to head back down. We went to check out the line for the tram and were told it would be about 20-30 minute wait. Not too bad, so we decided to wait. Soon, we were in the boarding area. The tram pulled up and I realized the seats are all facing backwards. I thought maybe the seats would turn around but no. To be honest, I was a little worried about going down the steep hill backwards, but there wasn’t much of a choice. Hong Kong has so many skyscrapers. I knew I wanted to be on the side closest to the buildings so I would fully experience the optical illusion of the buildings tilting. I got my directions confused and sat on the right side (when facing down the mountain). While I could still see the buildings on the other side, I think you would get a better sense of the illusion on the left side. The journey is definitely steep (at least parts of it) but going down backwards wasn’t as scary as I thought it would be. You can get an idea of what it was like to ride the Victoria Peak Tram by checking out the short video I created. Victoria Peak is centrally located on Hong Kong Island so it is not necessary to stay right by it. Since it is central, hotels in the area of the Peak are expensive. I stayed at the Island Shangri-La on my first trip to Hong Kong. It was luxurious and walking distance from Victoria Peak. (Click here to check reviews, price, and availability for the Shangri-La). The Conrad Hotel is also in the area and gets excellent reviews. (Click here to check reviews, price, and availability for the Conrad). Depending on your budget, it may make more sense to stay in another area and use public transportation to get to the Peak Tram Station. 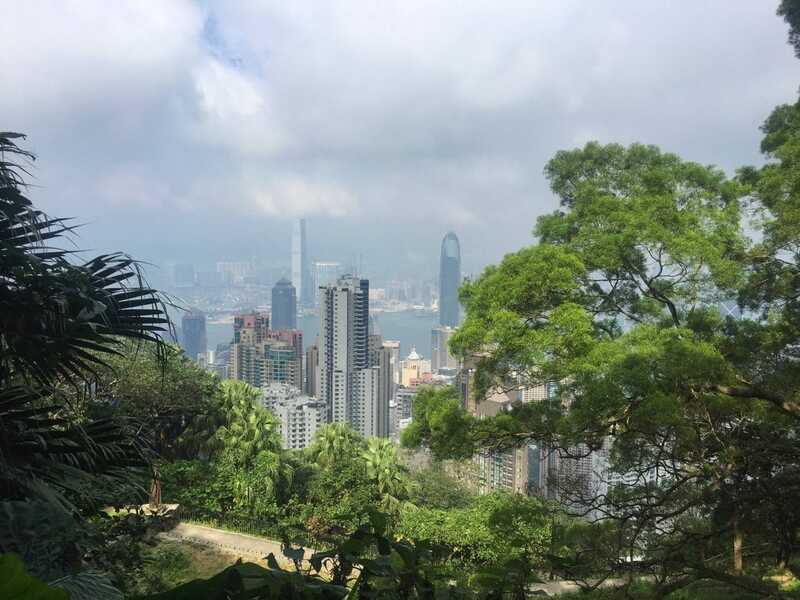 Regardless of the way you decide to get to the top of Victoria Peak or how long you stay to explore the area, you won’t be disappointed. I plan on going back again the next time I am in Hong Kong, but I will allocate at least a half day so that I can explore more. Maybe I will even visit Victoria Peak at night. I bet the skyline looks pretty all lit up. Even if you only have one day in Hong Kong, make some time to go to the Peak! It’s one of the top things to do in Hong Kong. I just love the view from Victoria Peak and the nice walking trails. Have you been to Hong Kong? What are some of your favorite spots to see the skyline? If the line to take the tram up is too long, take a taxi, but make sure to use the meter. 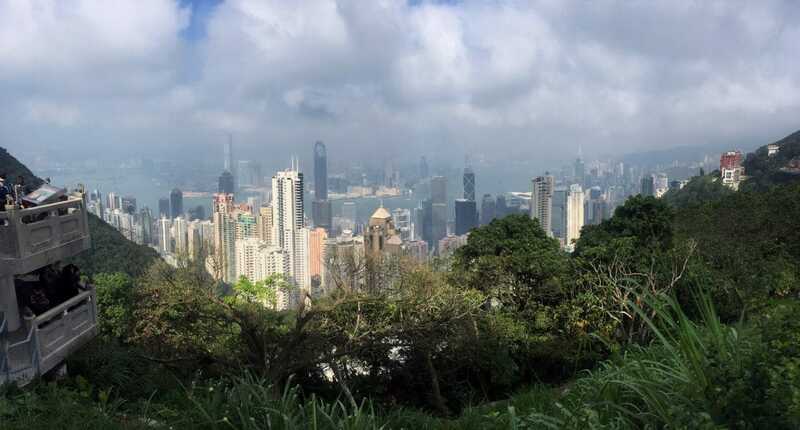 Allow time to explore the walking paths at the top of Victoria Peak. Sit on the right side of the tram going up and the left side going down to be closest to the buildings. If you are traveling to Hong Kong, you may also enjoy our post about the 10,000 Buddhas Monastery. Still on our must do list! Loved the video too, made us laugh! Great post! Paul & Carole! – Thank you! Yes you must go to Victoria Peak. Glad you enjoyed the video, will try to do more of those! I only had time to take the tram car up to the top, but I think there is a lot more left for me to explore. Its not too far from Australia, so I think I’ll have to prioritise it! Yes Laura you need to go back, it’s a beautiful area to explore. Jonny – Thank you! Glad you enjoyed the post. Anna – Thank you. Wow two months living in Hong Kong sounds wonderful. Glad you agree that Victoria Peak is a must see. I went to Lantau Last trip but will have to check out Lamma next time. I queued for a long time on an evening to go up via the tram and it was already darkness by the time we saw the views. Still spectacular though! Perhaps next time, I’ll try the taxi way like you did. Actually, come to think of it, the taxi method is cheaper if you’re not travelling solo, isn’t it? Kristine – Glad you enjoyed your visit. Yes the taxi is a good option and can be cheaper. I do think the tram is something everyone should experience at least once though. Thanks Hilary! Going backwards wasn’t actually as bad as I thought. The tram is a unique experience! I love a good viewpoint and I’ve seen fantastic photos like yours of the HK skyline from Victoria Peak. I totally believe that it’s a must see spot when visiting Hong Kong. Good to get tips on how to get there etc. Pinning for future reference. David – Thank you. So glad you enjoyed the post and agree that it is a must see. I hope you make it to Hong Kong soon to experience it for yourself. Sara – Thats too bad! I do hope you get to go back. It’s such a nice place to explore and the views are really amazing. Upeksha – Yes! I do really think it’s a must when you make it to Hong Kong. 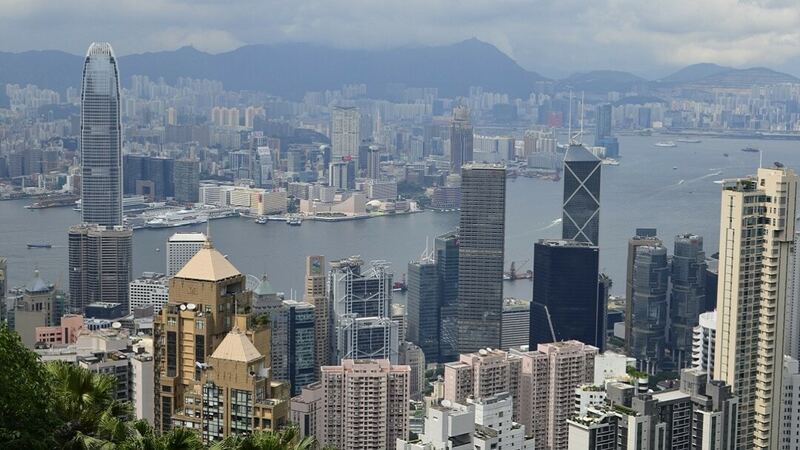 We always love to go to the top of places to get nice views over a new city, so I am sure I would love this whenever I get to Hong Kong 😉 Great info for options on how you can get to the top. Jessica – Yes I love taking it the city views. I hope you make it to Hong Kong soon. Glad you found the information helpful. Noemi – Yeah pretty bad huh! I just hope no one else fell for his scam! Thanks for all the tips! We’re heading to HK in April and hope to visit Victoria Peak, as well! Excellent. Yes definitely go to Victoria Peak. I’m sure you will love Hong Kong! Kathi – That sounds like a great plan. You are lucky to have someone who grew up in Hong Kong to be able to show you around. I am sure you will love it! What a view! I really enjoyed your video too. I’ve always loved photos of this view from people who visit there. We don’t have immediate plans to visit HK yet but when we do, this will be onr of the first things we’ll do. Mary – Thanks so much. I do really recommend visiting Hong Kong it is a really amazing place! I really love to visit Hongkong, I just been there once in their airport very beautiful. Yes Yulie, they do have a great airport. The city has so much to offer too so I definitely recommend spending at least a few days there. This place is really look amazing, I need to take my wife here. My wife and I are love to travel. Thanks Jeff. Yes it really is worth a visit. The views are so impressive.